The White Sands Missile Range Museum, located in White Sands Missile Range, New Mexico, is a literal physical piece of history. Visitors to the site will be able to see the place where the nuclear age began and learn about how this impacted life as we know it, even now. The missile range was established in 1945 and is still the largest overland military testing range in the United States, at 3,200 square miles. The first atomic bomb was tested here, at the Trinity Site, on July 16th, 1945. The museum opened in 1999 before closing for repairs, opening again after restoration was completed in 2004. Its mission is to educate people about the history of the nuclear age as well as the state of space travel, with a focus on how it relates to the White Sands area. 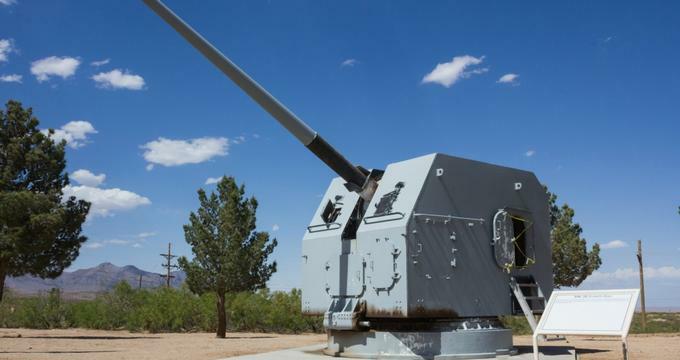 Just outside of the actual museum is the missile park, which displays a collection of some of the rockets and missiles that were previously tested at the White Sands range. Guests should make sure to check them all out, including the Pershing II, the WAC Corporal, the Loon (which is the US version of a V-1), and the Patriot. There are over 50 different items available to see, and they can also be viewed on the White Sands website. The inside of the museum features a variety of exhibits as well. - V2 Tank- This hydrogen peroxide tank was powered with a mix of both alcohol and oxygen (in its liquid state). A “turbopump” was invented because of this tank, which allowed the oxidizer and fuel to be pumped as quickly as was necessary to sustain the flight energy needed. Inside the assembly was the hydrogen peroxide that mixed with sodium permanganate which created the steam that drove the turbopump) and allowed the V-2 to hit over 100 miles of altitude. - Atomic bomb model- The museum features a scale model of the very first atomic bomb ever detonated at the Trinity Site. - V2 motor: On display at the museum is an actual rocket engine that has been cut open in order to better display the inner workings. - Slide rule- Before scientists and students were able to easily work out math problems on a calculator, they had to use a slide rule like the one on display at the museum. This specific slide rule is the type that was specially designed by German scientists in order to accurately calculate rocket trajectories. - Portable calculator- Not quite the kind most guests will be used to, this “portable” calculator was used by the scientists at White Sands to look at date from the early missile experimental findings. - Drone Control System- The museum has on display a formation control system from the 1980s that was used to pilot drones using the joystick on the machine. There are also many more things to see, including exhibits focusing on the local prehistoric cultures as well as the Old West history so guests should make sure to budget at least a couple of hours to see it all. The museum is open all year round on weekdays from 8am to 4pm and on Saturday from 10am to 3pm. The missile range and museum is a perfect place to take students to introduce them to the history and importance of the White Sands site. The field trips are best for grade levels 9 through 12 due to the frank discussions of war. Contact the staff at the museum for additional information including cost, number of chaperones required, and types of tours being offered. If possible, teachers can request a tour guide to lead them through the missile site, park, museum, etc while explaining the history in a fun and engaging way. Reservations are highly recommended and can be made by contacting the museum directly at least a few weeks in advance of the planned field trip. Teachers can plan ahead by talking to students about the nuclear age, the birth of space exploration, and the history of White Sands and the Trinity Site. They can also discuss the political changes that were brought about by the first atomic bomb explosion in history. There is a small gift shop located at the missile museum which sells a small collection of merchandise like books and DVDs that focus on the history of the site and the missiles that were launched there. Guests can also purchase commemorative pins, personalized bricks, or just choose to make a donation to help support the mission of the museum as well as its daily operations.